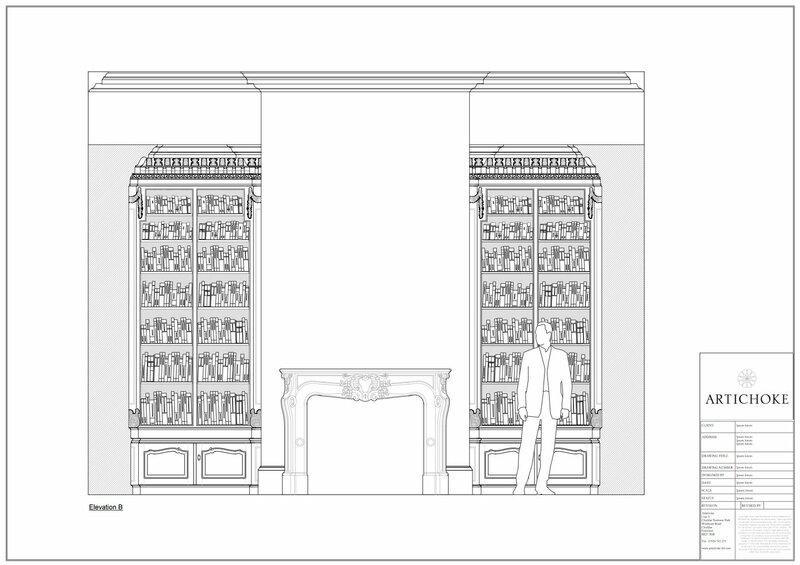 In late 2013, Artichoke’s architectural design team were approached by the new owner of a magnificent late 17th Century Grade II* Listed Georgian Hall in the English countryside. The Hall sits in gently undulating parkland with some quite magnificent architectural design features which include a listed fishing temple with a pedimented Roman Doric portico, and listed Palladian stables. 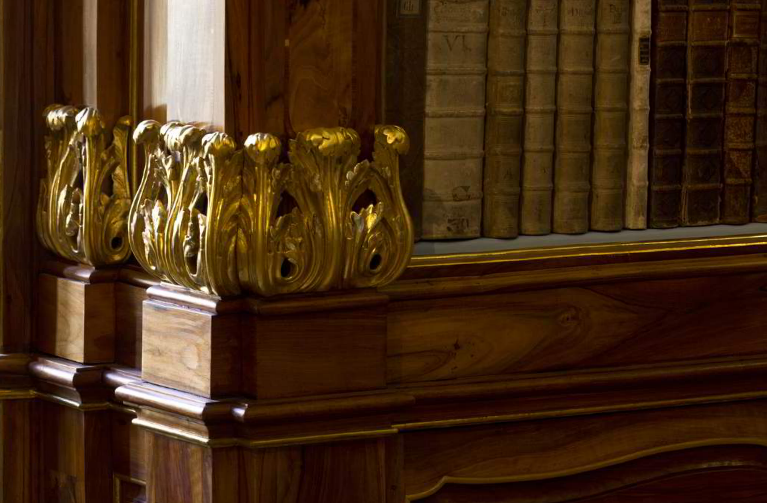 Among the requirements for the Hall was a grand library in the Baroque style. 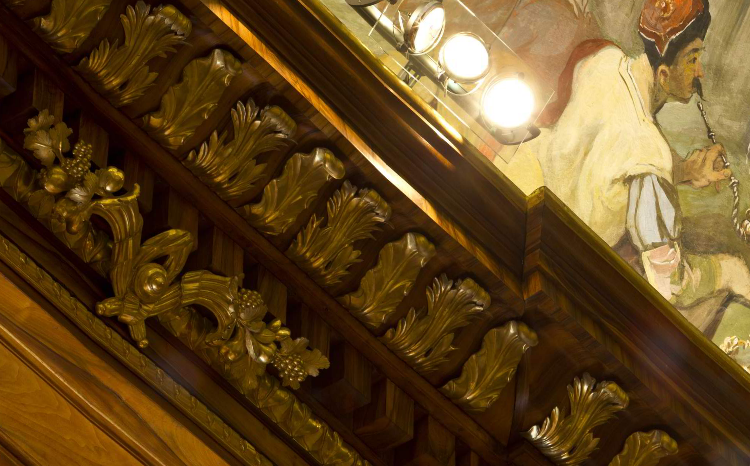 For those unfamiliar with Baroque interior design, it can best be described as a dramatic and theatrical take on Renaissance architecture, often including bold features such as opulent use of ornaments and colour, gilding and carving. 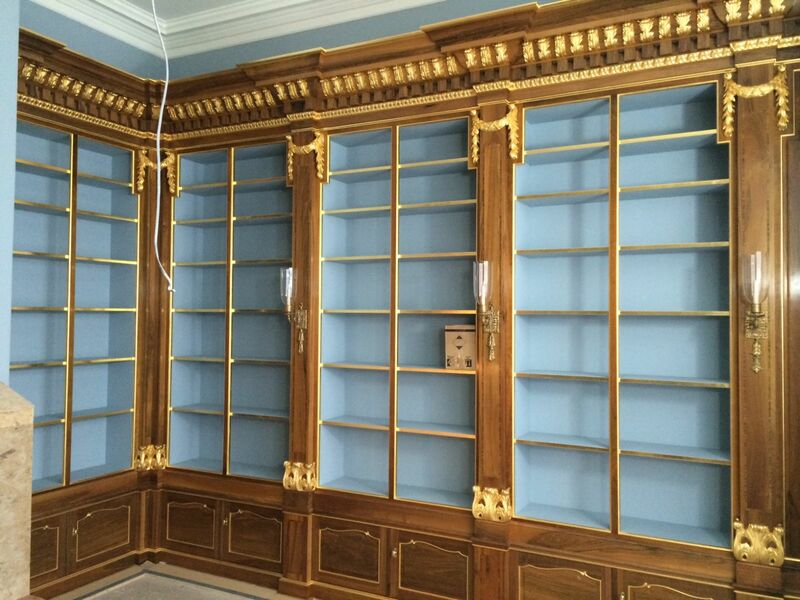 For interior architectural designers and cabinet makers, this is an deeply interesting and challenging project. There are many baroque rooms to take inspiration from when preparing an interior design of this nature. 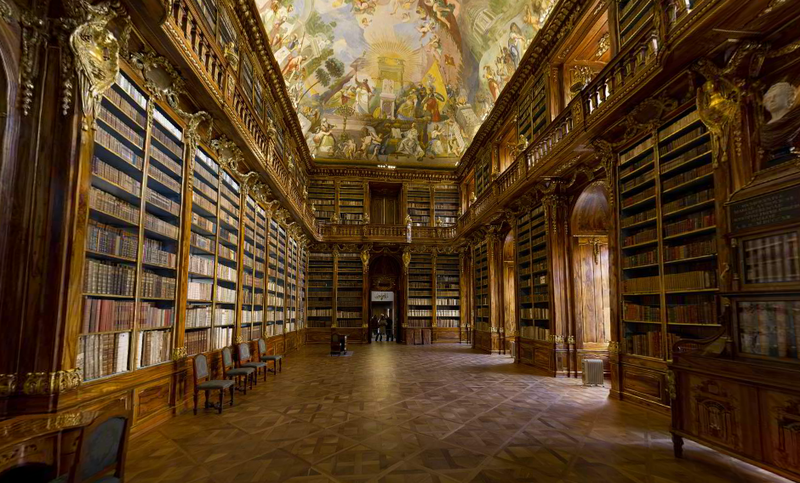 During design meetings with the Hall’s owner, one particular room caught our eye, the breathtaking Philosophical Hall in the Strahov Monastery in Prague, arguably one of the most beautiful libraries and interiors in The World. 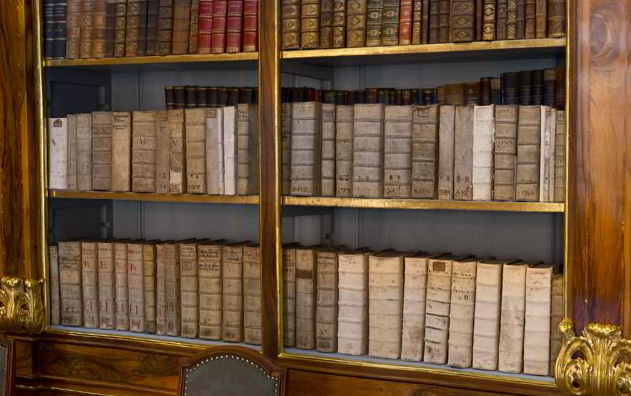 The library in the Philosophical Hall was built in 1779. We flew to Prague to survey some of the detail (with kind permission from the monastery). 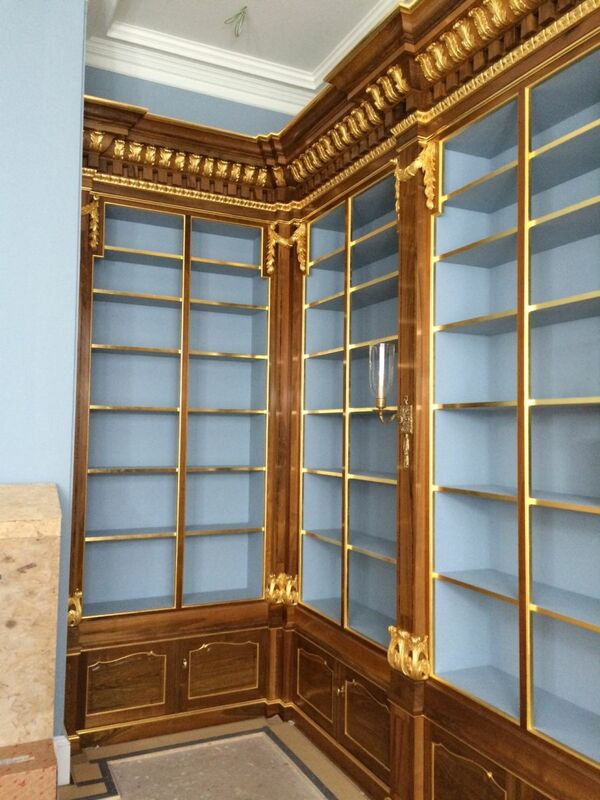 Stunning wild grain walnut was used throughout the library because it is so beautiful and works well in a room of this size. 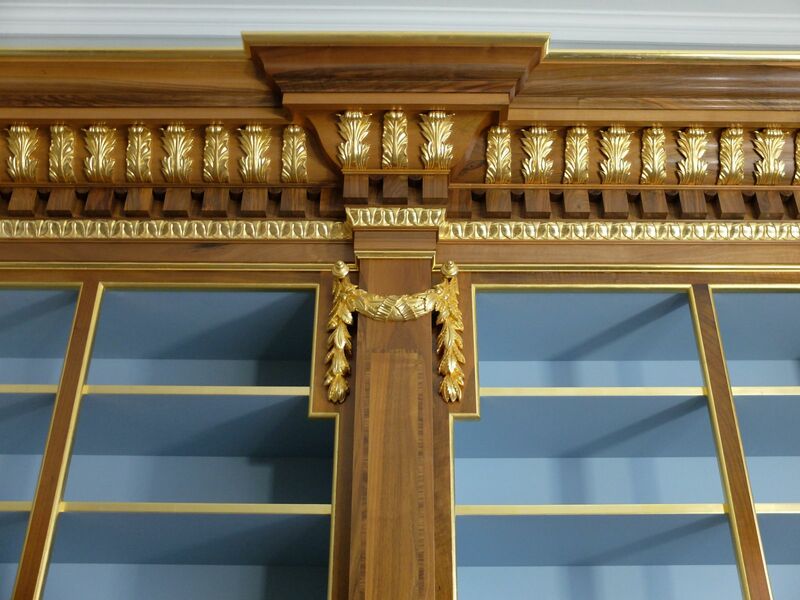 Close up of the entablatures below show the gilded swags and tails, egg and dart, dental mold and gilded acanthus leaves. 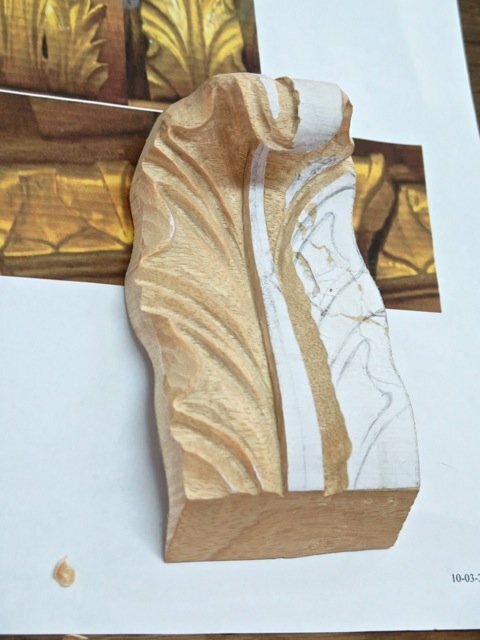 This image shows work in progress of the carved gilding work. 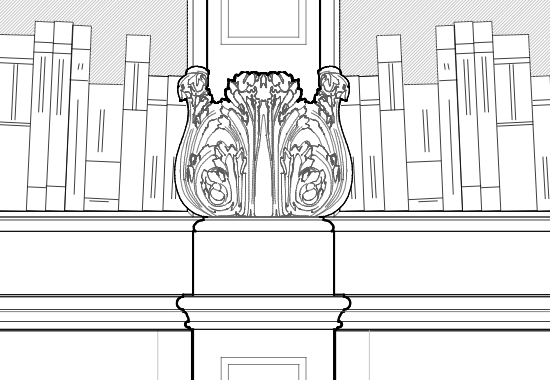 All the carving in the library is being undertaken under Artichoke’s direction by Ian Agrell Carving, an English company with offices in London, San Rafael and Calcutta. 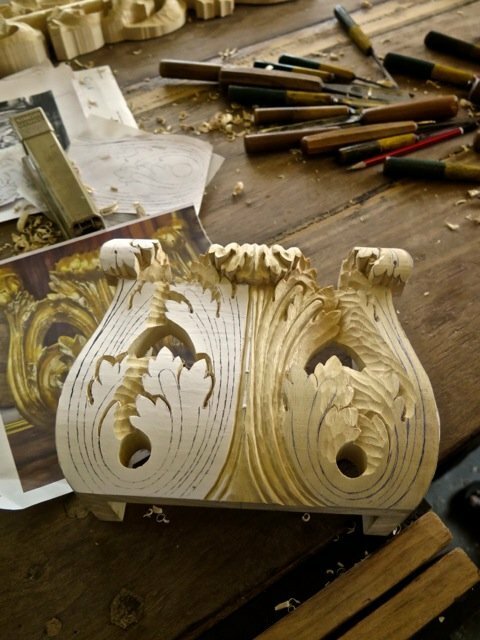 The company is run by master carver Ian Agrell, one of the few carving companies who never carve by machine. Their work is of the highest possible quality (which is why we use them). 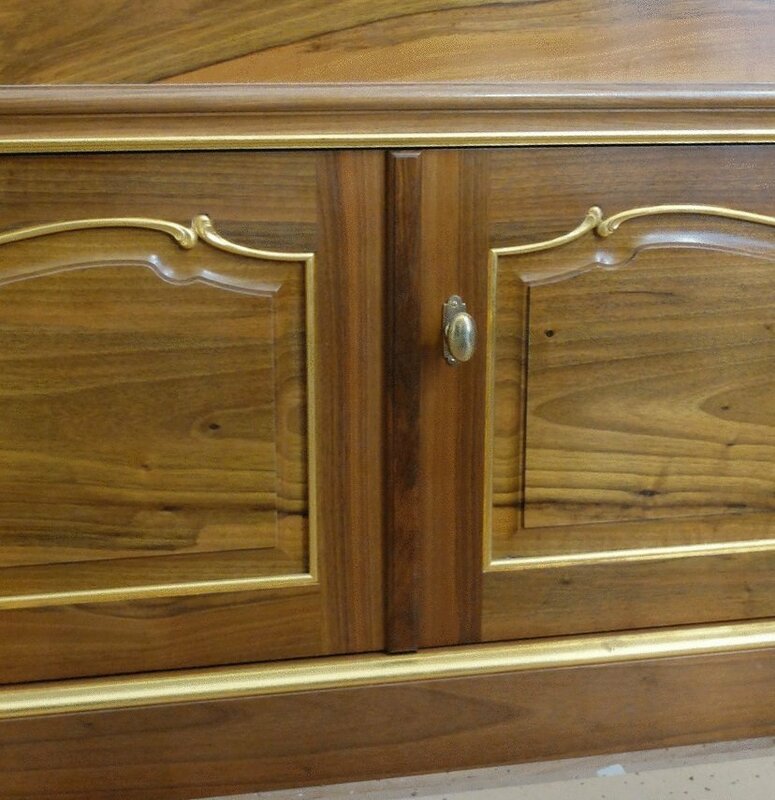 All of this work is undertaken by eye using the sharpest chisels. Ian’s video is below. 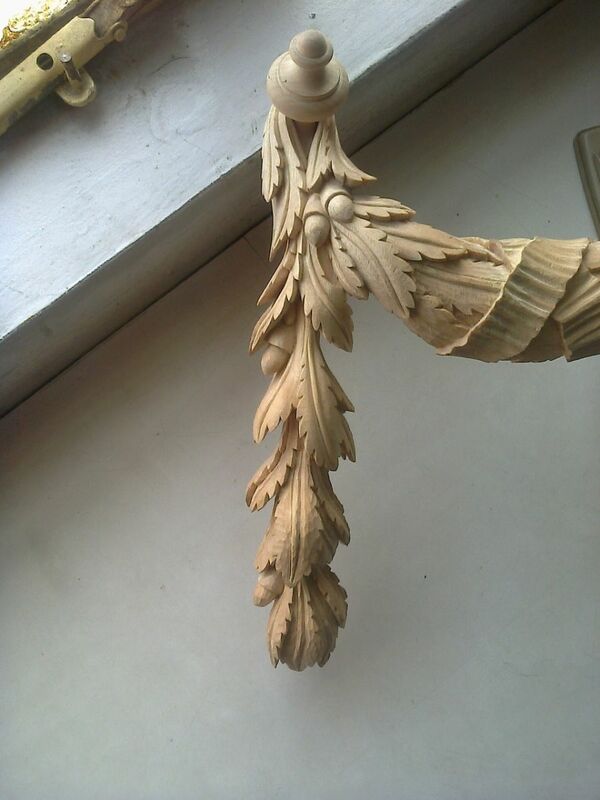 An acanthus leaf being worked on by hand. 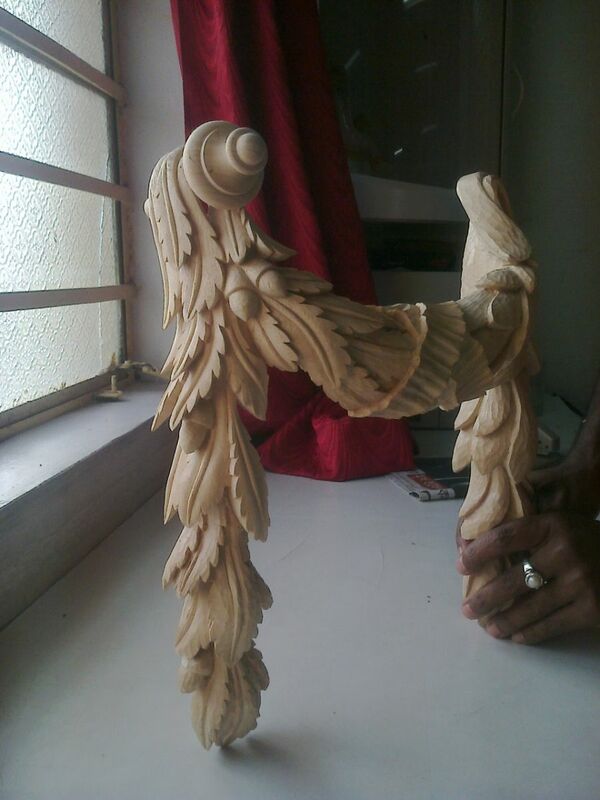 The carving is undertaken in Calcutta by carvers specially trained in classical detailing. Their work is crisp, accurate and leaves an excellent surface upon which the gilding teams can layer their gesso and gild work. 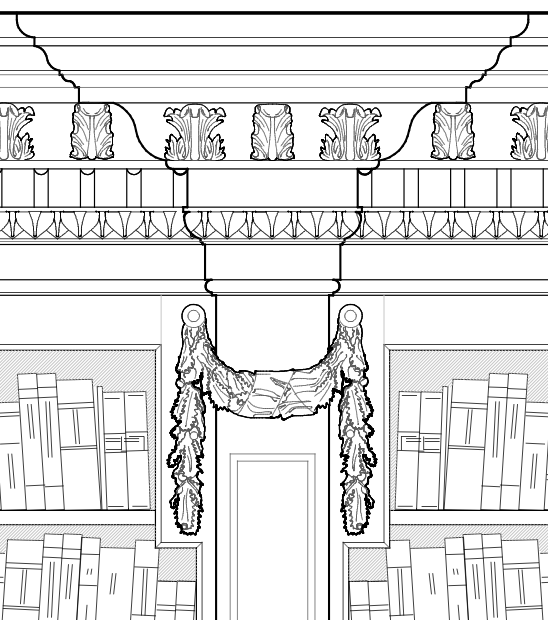 Note how the hand-drawn paper template guides the carver through the shapes and layers of the detail. 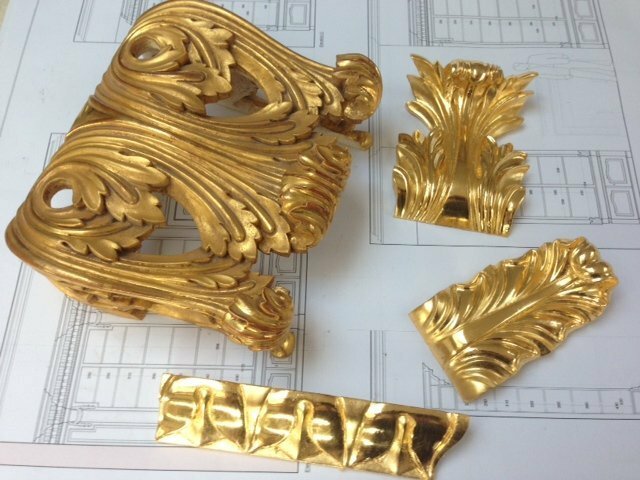 Samples of gild-work were produced concurrently to help gauge the correct level of brightness for the final gild work. 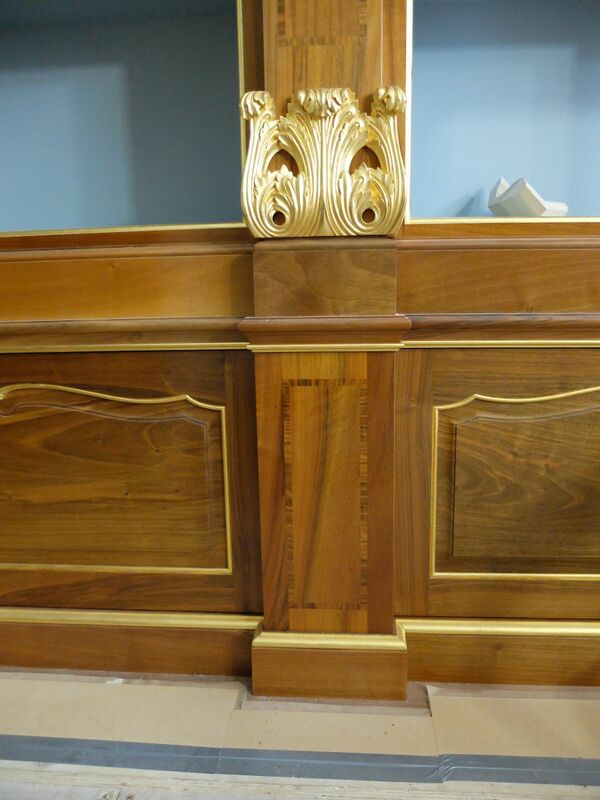 The above image shows how different types of gilding can alter the final look of carved work. 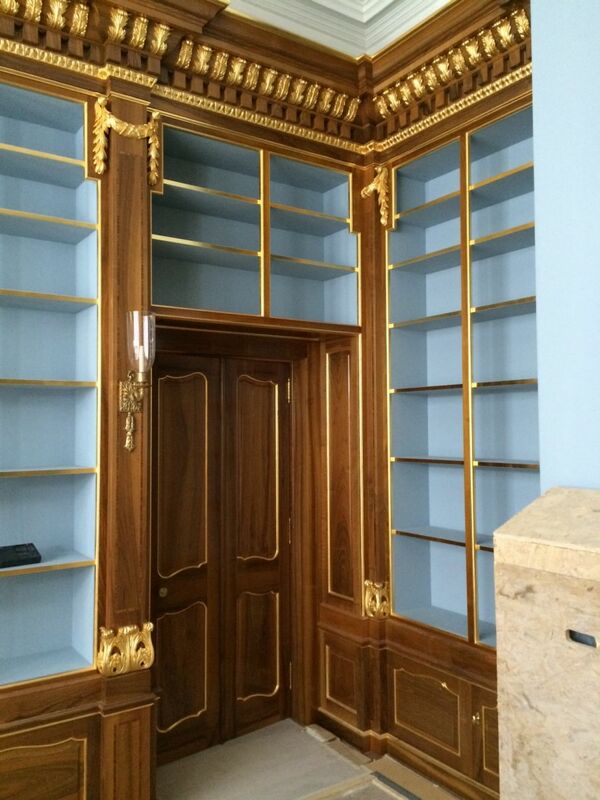 We have specified water gilding for the library which is a traditional method of applying gold leaf to a surface. 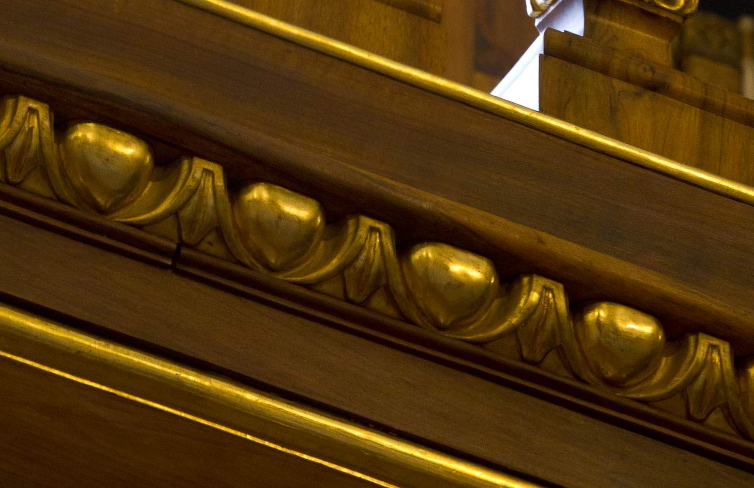 It is the highest quality of all gilding methods. The larger piece on the left has been lightly antiqued to look in period, while the other items have a much brighter and fresher tone. 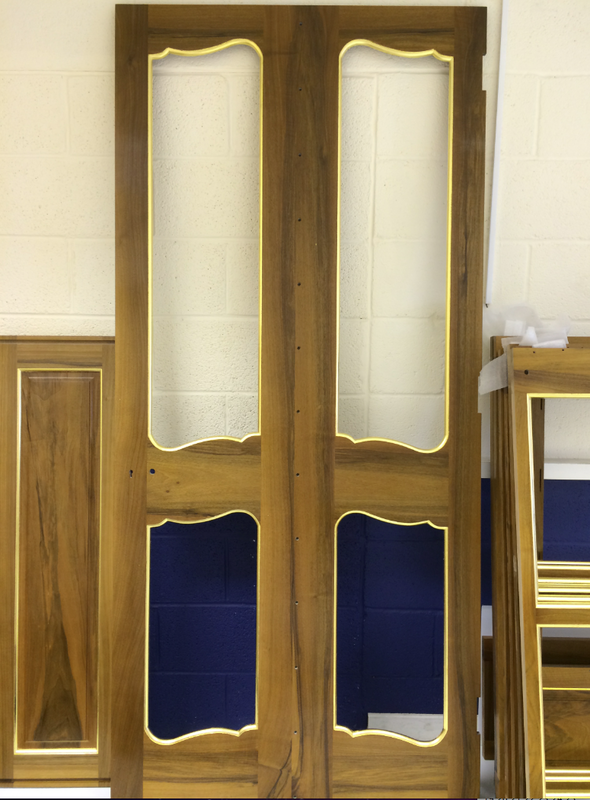 We are partnering with Gareth from Watergilders who is undertaking the water gilding of these items. 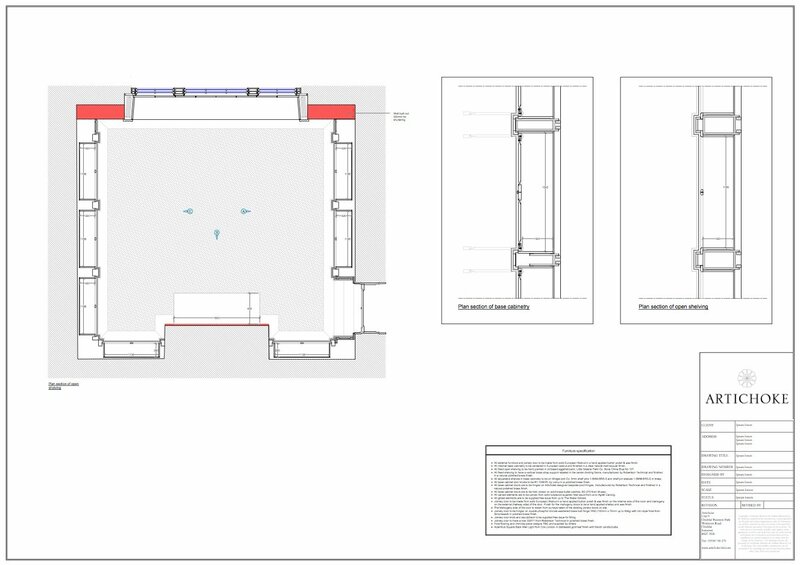 Once the final creative design is signed off, we move on to the Production Engineering phase where Artichoke’s technical designers model the room in 3D to work out the most efficient and best methods of constructing the room. 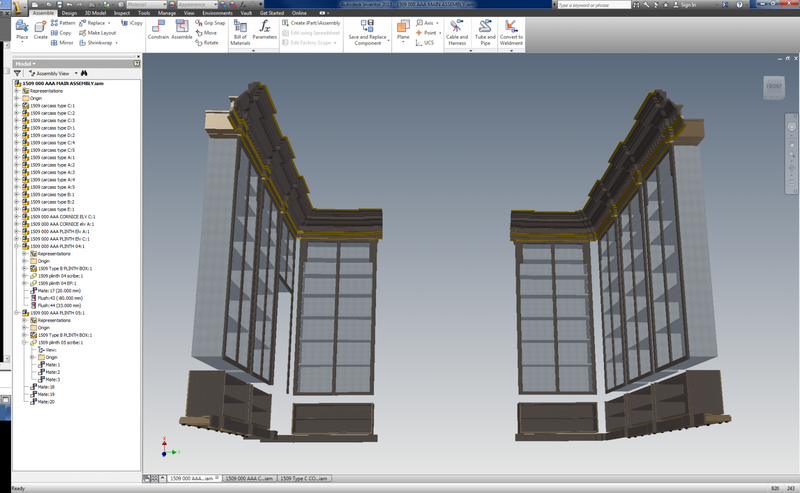 We are, in effect, digital cabinet making at this stage. Each component is constructed in digital form so we know how it interacts with other component parts. 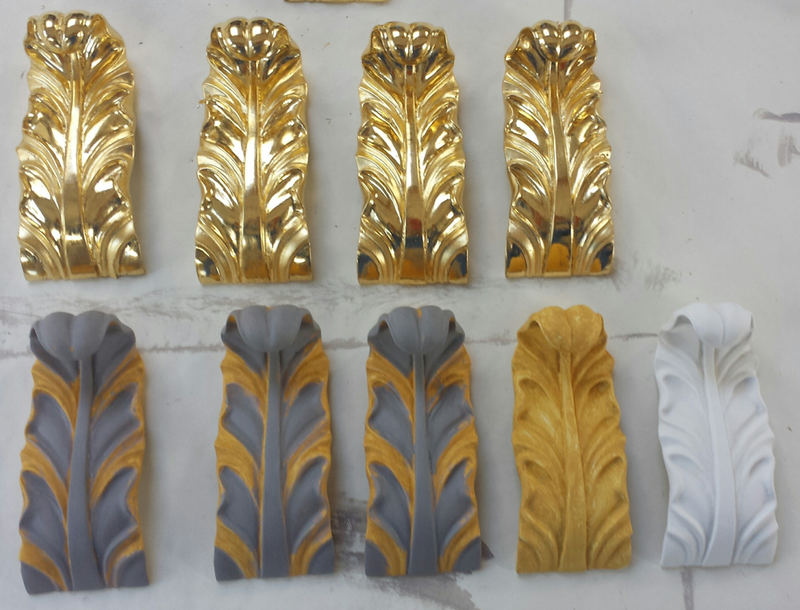 The image below Shows the various stages of the water gilding process being undertaken by the Watergilders team. 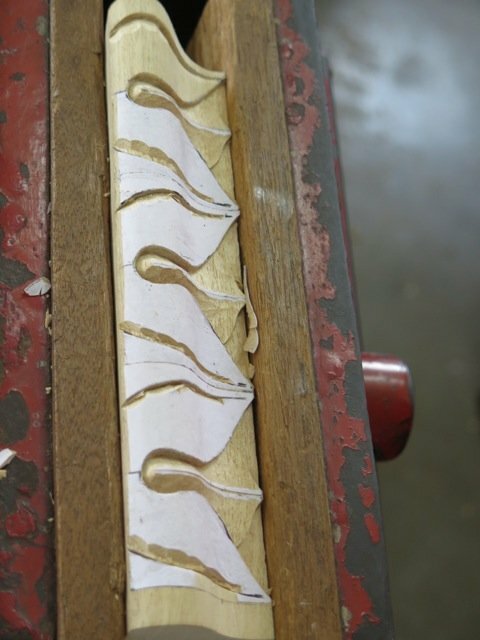 Up to ten layers of gesso are added to the timber substrate and smoothed down (bottom right) before a yellow gold gilding clay is added. 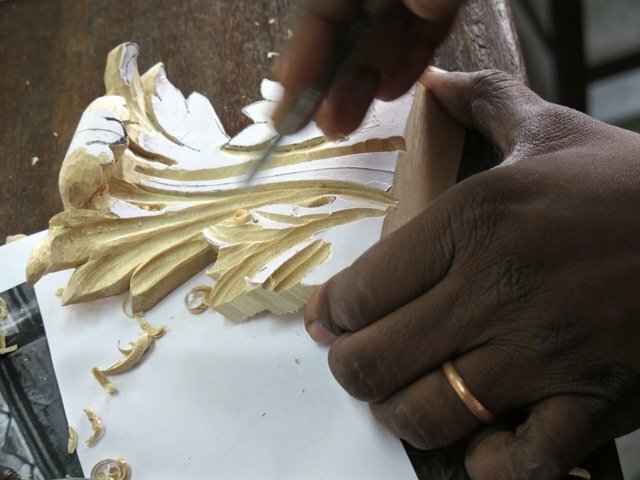 Burnishing clay, or bole, is then added to parts of the leaf before the gold leaf is added. This is then dampened with water to encourage the leaf to stick to the surface before it is then burnished with an Agate stone. 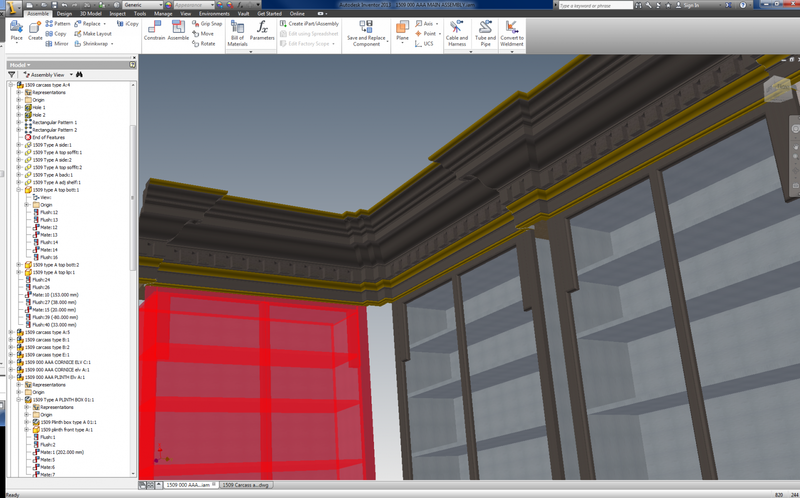 Part of the cornicework in the workshop. 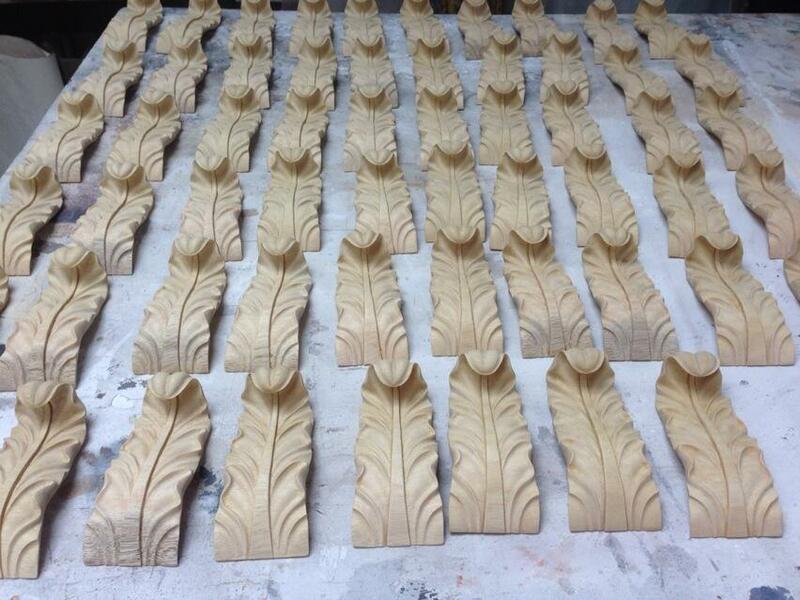 The central band of carved lillies will be water gilded. 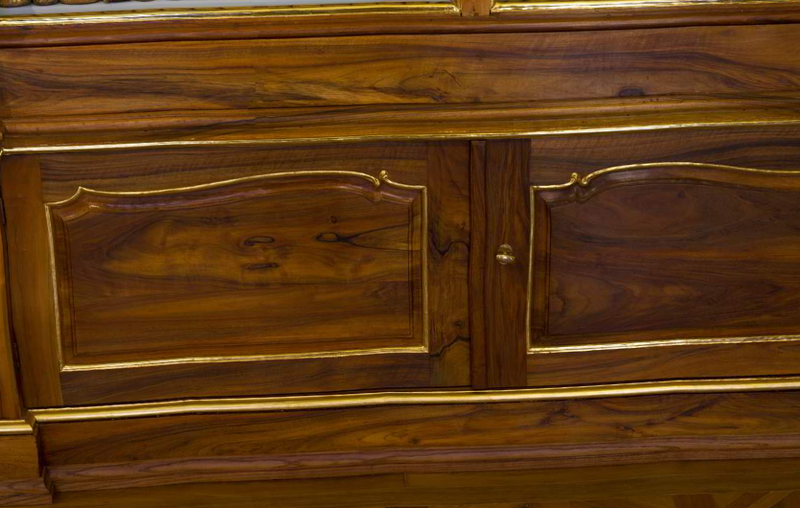 The timber is European Walnut. 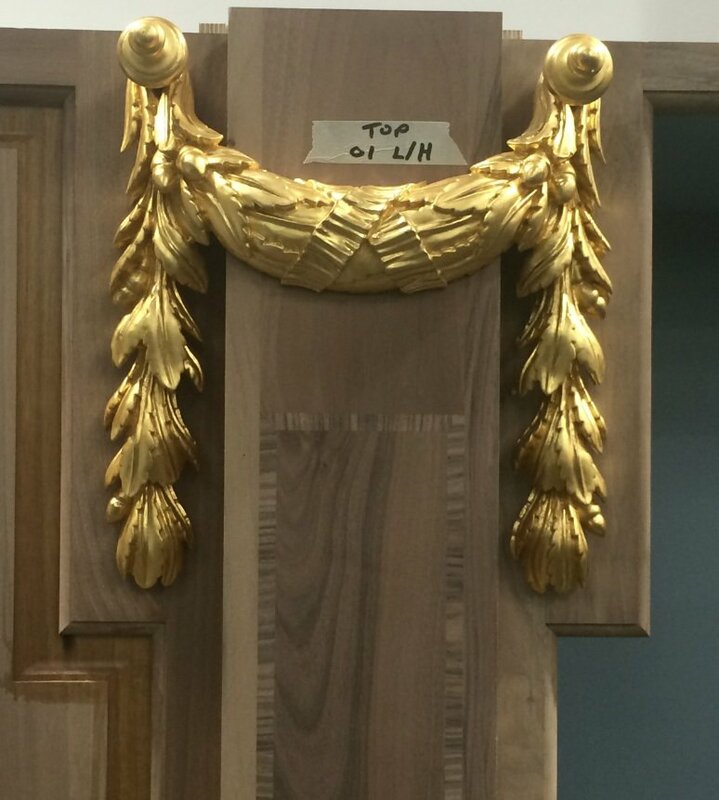 Below are images of the base cabinets in assembly at Artichoke’s workshop with the hinges about to be fitted. 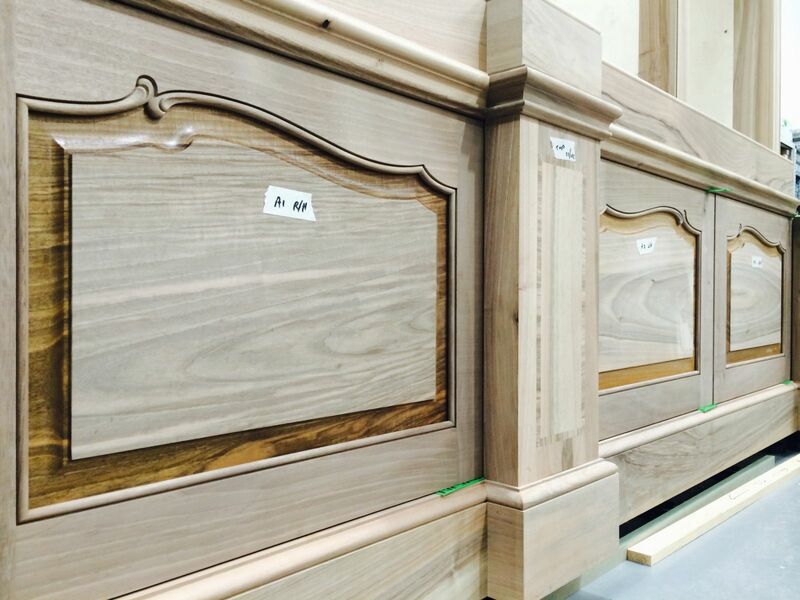 Finish has already been applied to the perimeter of the panels which are made from solid walnut. These solid panels will contract in size as the timber acclimatises to the domestic environment. 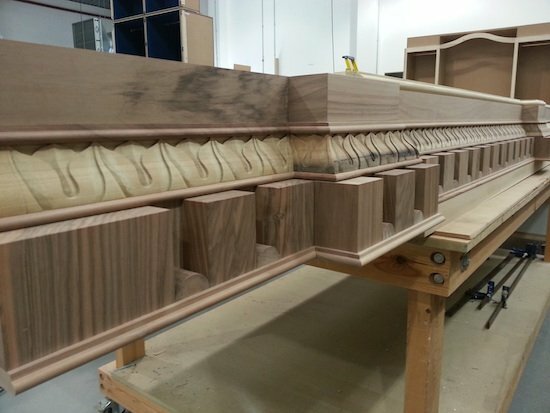 Pre-finishing the edge first allows for the panel to contract within the frame without revealing any unfinished timber at the shrinkage points. Below are images of the watergilded bases and swags fixed in position. This Video shows the gilders applying oil gild to the walnut frames at Artichoke’s worktops. The installation phase of every project is potentially the most risky. A great deal of effort is placed on ensuring that we install at the correct time, and that the environment is not damp, dusty or busy with builders and other third party trades. Finally, as a surprise for the client and a thank-you gift to them from us, Artichoke secretly designed in this book operated secret drawer. 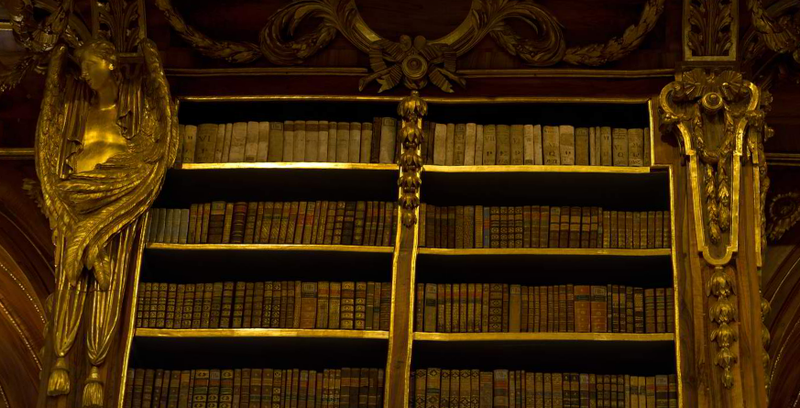 Every great baroque library should have one! For further information regarding Artichoke’s work, please contact us.